But what about Magnus Nielsen, the UKIP candidate for Camden Council whose offensive Facebook comments have received widespread coverage in the media? Farage can’t claim he’s never heard of Nielsen, who has a long history as a party activist. He stood for UKIP in the Barnet & Camden constituency in the London Assembly elections of 2000, 2004 and 2008. He was also the party’s parliamentary candidate for Hampstead & Highgate in the 2005 general election and for Hampstead & Kilburn in 2010. Nielsen’s extremist views were hardly a secret. In 2010 the Guardian reported that he was a supporter of the English Defence League, had agreed to speak at their rallies, and described the Prophet Muhammad as a “criminal psychopath”, “the first cult leader” and “psychiatrically deranged”. And now we know Nielsen thinks that “any Muslim who is not involved in organised crime is not ‘a true believer’, practising Islam as Muhammad commanded”. 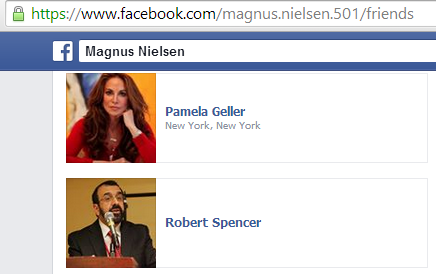 To this we might add that Nielsen’s Facebook friends include Pamela Geller and Robert Spencer, the two US Islamophobes banned from entering the UK to speak at an EDL rally last June, because the home office stated that they were responsible for setting up “anti-Muslim hate-groups”. Yet, so far as I’m aware, UKIP has still not withdrawn its endorsement of Nielsen’s candidacy. Are Nielsen’s views not “entirely inconsistent with being a member of UKIP” too? Is Farage happy that Nielsen should remain chairman of the party’s Brent & Camden branch? Does he regard a man with Nielsen’s record as an acceptable representative for the party in local government?